Click to viewApple's Time Capsule backup server is a great idea, and looks great as well. It's the same size as the Airport Extreme, but seems heavier. 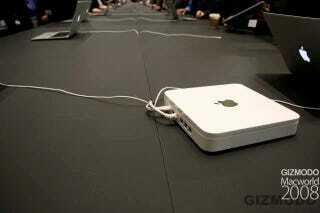 It has the exact same ports as the Airport Extreme (four Gigabit Ethernet ports, normal power ports) and has 802.11n. The top is different and has a chrome reflective Apple logo. There's not much else to say until we get our hands on it at home and test it ourselves, so check out the gallery to see how it looks. Bad news: The hard drive isn't user replaceable. A guy said he didn't think you could use it for NAS, but it connects to Finder like a normal NAS, so it probably can be used that way.